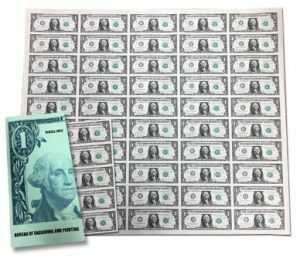 Today at 8:00 a.m. EST, the Bureau of Engraving and Printing (BEP) started selling uncut currency sheets of Series 2017 $1 Federal Reserve notes. These dollars bear the signatures of U.S. Treasury Secretary Steven T. Mnuchin and U.S. Treasurer Jovita Carranza. 50 subject sheet for $86. Each has respective premiums of $13.50, $17, $23, $25.50, and $36. The BEP ships free and does not charge tax. 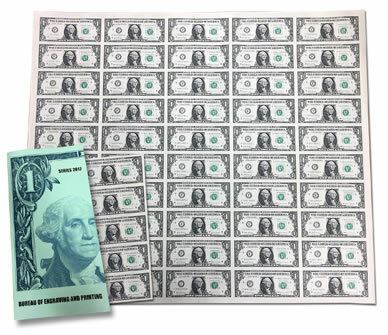 The new Series 2017 $1 Uncut Currency Sheets are available from the BEP online store at www.moneyfactorystore.gov/uncutcurrency.aspx.